The last thing Griffin Hale needs at his bar is a nosy artist looking for personal stories to turn into movie plots. He has carefully cultivated a scene of complete normalcy for people who need it more than Annie could possibly imagine, and it's his job to protect them. But the beautiful redhead with the compelling green eyes is difficult to turn away. Annie's fantasy world where good always conquers evil is not the life that Griffin has lived, and he can't help but think she'll never be satisfied with anyone less than a superhero. After a string of bad relationships, Annie willingly admits that most real men don't live up to her muscle-bound, cape-wearing protectors of the world, but when her stubborn curiosity propels her into a danger she never expected, she begins to realize that some heroes work in the dark…and a man who fights for you is a man worth fighting for. Don't miss any of the Callaways! I was instantly pulled into the book with its' suspense and intrigue from the get go. Barbara has a way of giving you just enough making you want to continue reading and find out more. The mystery of what was happening had me guessing until the end. The chemistry and tension between Griffen and Annie jumps off the page. It also has humor and heart, with an emphasis on helping others, loyalty and strong family ties. It was great catching up with the whole Callaway family. A must read for all Callaway fans. I voluntarily reviewed an Advanced Readers Copy of this book. Griffin and Annie. What can I say. I absolutely loved this book and love love the series. So looking forward to the next one. CAN'T LET GO. Barbara..Freethy. "Callaway Cousins" book 5. Dec 26 Annie looking for inspiration for her next project, finds a quaint bar, and run by one handsome guy Griffin. Would he be her superhero, or would curiosity lead her into trouble. A woman comes and Griffen immediately whisk her upstairs, was he doing the right thing. Another lifetime he would of said yes, and hopefully Annie would be gone. A fundraiser for the holidays, and she is asked to do flyers and design a t- shirt. Which means being around Griffin more, and her curiosity is getting more soon . I enjoyed this story, one's is also curious of what is going on. A love story with a good mystery angle to it. Readers will definitely like this, and not wanting to put it down. Loved this book from start to finish, lots of interesting details and mystery with a dash of romance. Way to go! Another Callaway installment. 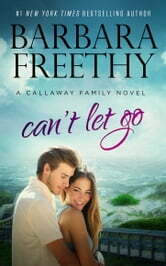 This story had romance, mystery and action, all in all a sweet read as are all the books I have read by Barbara Freethy. If you are looking for entertainment, try Perilous Trust and the Lightning series those still top my list. Worth the time spent.